Boxed in original packaging, this Christmas ornament is by Kurt S. Adler. Measures 4 1/2" tall, and appears to be hand painted resin. It is Lucy of the Peanuts gang. She is in her band uniform and appears to be leading the band! 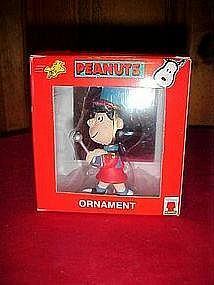 A great collectible to add to your Peanuts gallery.